Mushroom Machinery Manufacturing Pvt. Ltd. Expertise in Automation of Mushroom Growing Unit & Plants in India. Mushroom Machines do Automation of Existing of Mushroom Growing Units or Plants. we makes automation machinery which includes AMMONIA COMPRESSOR AUTOMATION, DIRECT EXPANSION COOLING SYSTEM AUTOMATION. Beside this we also provide Mushroom Project consultancy service to our Clients which is most helpful in mushroom farming. we also makes Mushroom growing unit machinery i.e SPAWN DOZING & BAG FILLING, WATER SPRAYING MACHINE, ENVIRONMENTAL CONTROL SYSTEM Mushroom Composting Unit Machinery that includes Compost Turner Machine, BIO-COMPOST MIXING & BAG FILLING, STRAW PASTEURIZATION MACHINE, COMPOST TUNNEL, COMPOSTING AHU. Spawn Lab Machines Setup, Post Harvesting equipments. 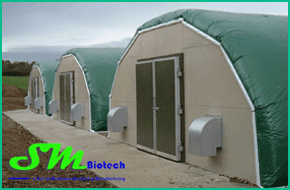 mushroom shed construction, Mushroom air handling unit & Mushroom growing rooms.